Cottonelle is still searching for an "official" name for their Cottonelle Care Routine. If you haven't entered the contest, pop over and use the "Name It" generator on their Facebook page. 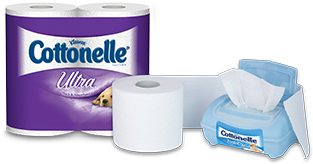 You could win a year's supply of Cottonelle products if you come up with the winning name. The contest ends February 25, 2013 so be sure to stop by and enter before then. Try the widget below & see what name you get. Some of the outcomes are pretty funny. The Lil Divas love clicking it over and over again and reading all the names. We get lots of giggles with it. What name did you get? Maybe you came up with one of your own. Whatever the method, be sure to share in the comments below - we love reading them. Good luck if you enter the official contest - I'd love for one of my readers to be the winner. What supplies do you keep in your bathroom to keep fresh & clean? We are a tried and true Cottonelle family. My family always uses Cottonelle wipes and toilet paper both for our guests and for our own personal use. It is definitely our preferred method to stay clean and fresh. What's yours? Disclosure: I participated in this Ambassador campaign on behalf of Mom Central Consulting for Cottonelle. I received product samples to facilitate my review and a promotional item as a thank-you for participating.